ad:tech Kyushu focuses in the Kyushu area of Japan, contributing to nurture global business people. The event is a perfect opportunity to increase your company’s brand awareness and introduce your service to the local key person in Kyushu. materials which are distributed to all attendees who come to the event. The logos printed on your booth and the floor map will also help extend recognition to those who you might missed the chance to meet at your booth. 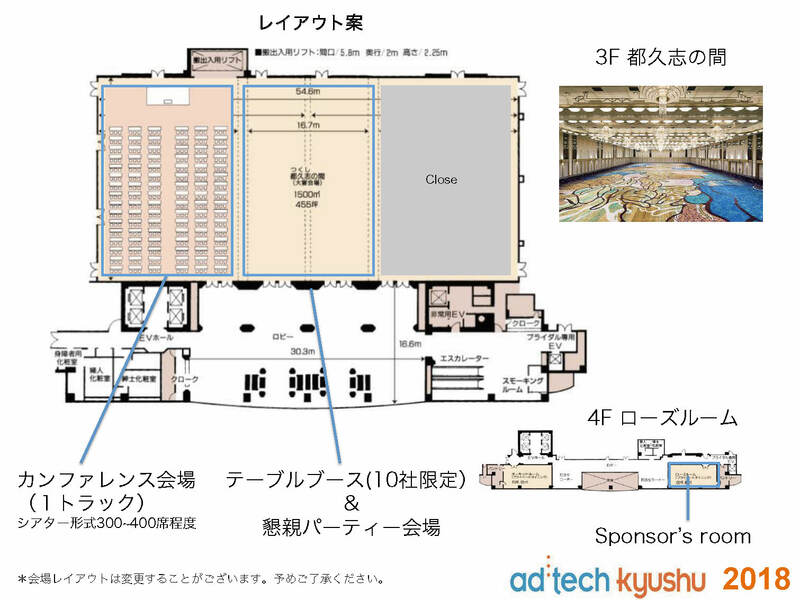 Focusing on gathering attendees from the main prefectures of Fukuoka, ad:tech Kyushu will also have attendees coming from the Tokyo area as well. This is an efficient place to meet and connect with the key people of Kyushu’s local companies to exchange information about competitive research and current issues. You can use the exhibition opportunities as a loyalty program, by conducting an educational seminar at your booth for your existing customers or explaining the company’s newest services towards new and existing customers. The exhibition space is located next to the conference hall.